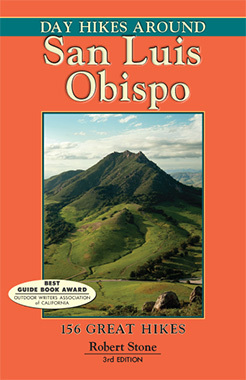 Winner of the Best Guidebook Award from Outdoor Writers Association of California! San Luis Obispo County is located where the white sand beaches of Central California merge with the dramatic Big Sur coastline. Ranging inland from the Pacific Ocean are oak-studded hills, verdant farmland, pristine mountain lakes, and the 5,000-foot Santa Lucia Range of the Los Padres National Forest. The unique geography and a temperate, year-round climate creates an outstanding hiking environment. Day Hikes Around San Luis Obispo now includes over 150 day hikes throughout the coastal county. This greatly expanded third edition is easily the most comprehensive hiking guide in the area. The trails take the hiker along the scalloped Pacific coastline to secluded coves and tide pools, to rocky promontories along the chain of volcanic morros, through wetland sanctuaries, across massive sand dunes, and up cool interior canyons. Highlights include waterfalls, bluffs, long stretches of beach, lighthouses, lakes, rivers, swimming holes, extraordinary rock formations, and panoramic views that span from the inland mountains to the ocean. Many hikes are found in or near San Luis Obispo, although most hikes are located in undeveloped tracts of land and along 100 miles of coastline. A range of hikes is included, from easy coastal walks to high elevation climbs. Companion guides include Day Hikes On the Central California Coast, Day Hikes Around Big Sur, and Day Hikes Around Santa Barbara.